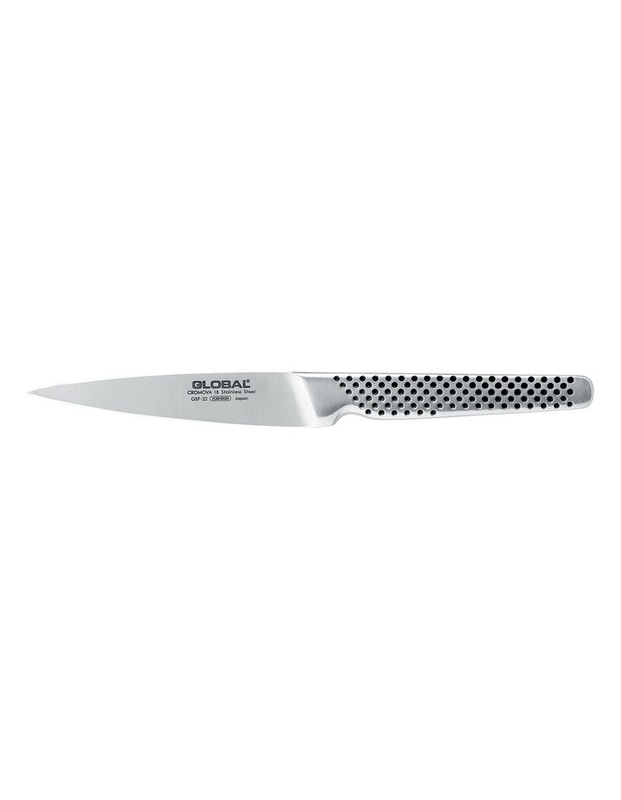 Global Utility Knife is excellent for everything from sandwiches to vegetables to smaller pieces of meat, a utility knife handles a range of jobs very well. From humble beginnings in 1985, Global have developed into one of the cutlery industry's outstanding success stories. Komin Yamada's remit was to develop a range of knives which was truly new and revolutionary, harnessing the best materials available and the most modern design concepts. With an almost unlimited budget he was to fashion a series of kitchen knives which would appeal to the professional and amateur chef alike, be comfortable and easy to handle, and meet their most demanding requirements. Global Utility Knife 11cm. Global knives are made from the finest stainless steel material. The blades utilise CROMOVA 18 stainless steel, Ice tempered and hardened to Rockwell C56?- 58? which holds a razor sharp edge longer than any other steel and resists rust, stains and corrosion. Like the Samurai swords before them, each knife is carefully weighted to ensure perfect balance in the hand. The smooth contours and seamless construction eliminate food and dirt traps, offering the ultimate in safety and hygiene. It is recommended that you wash your Global knives by hand using a mild dishwashing liquid and water. After washing, rinse with water and dry thoroughly with a towel. Global knives should NOT be put in the dishwasher.